So do mass shootings just have to be accepted as a cost of the Second Amendment? For the reasons I’ll discuss below, I don’t believe this to be true. As I mentioned in my previous post, the questions of why people are committing violent crime, why they choose firearms for the task, and what we can do to stop them show that there are a broad range of motivations for violent crime, that guns are usually selected for their intimidating purpose, not specifically to kill, and that reducing this type of violence requires a broad, proactive approach that gets at some of the fundamental issues that drive criminal behavior in the first place. Unlike this larger, more pervasive, and more nuanced problem, the problem of mass shootings is a bit more straightforward. One thing that makes an answer more straightforward is the inverse of a point I’ve made before: just like addressing the problem of gun violence through the lens of stopping mass shootings is less helpful because these shootings are a tiny subset of all violence taking place, the relative rarity of mass shootings means that they actually conform to a pretty similar set of situations, allowing them to be addressed as a more uniform set. Some of the characteristics of mass shootings highlight the differences between these crimes and gun violence generally. Probably the most obvious difference is that the mass shooter arms himself very much for the purpose of killing. 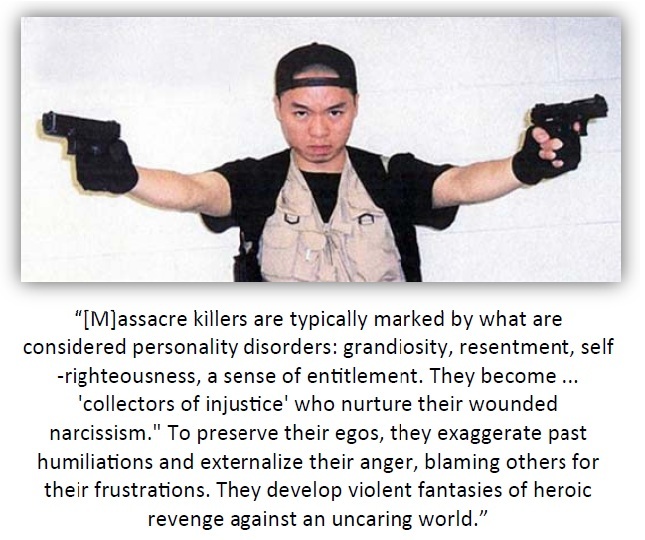 (Take, for instance, excerpts from the diary of Elliot Rodger, the Isla Vista shooter who selected his pistols based on their accuracy and “efficiency.”) The mass shooter is set on inflicting casualties and instilling fear — all part of a bigger plan to make a public statement or settle some grudge against society (either a particular part or the social order generally). In fact, although a shooter is triggered into action by a variety of circumstances that are very difficult to predict in an individual case, shooters’ motivations tend to conform to a pattern that we can look to for solutions. So, what are these motivations? To answer this, we must look at the characteristics of a shooter and unpack the ultimate goal of their actions. As mentioned above, despite their various specific idiosyncrasies in circumstance, there is a remarkable similarity between those who commit this type of act. 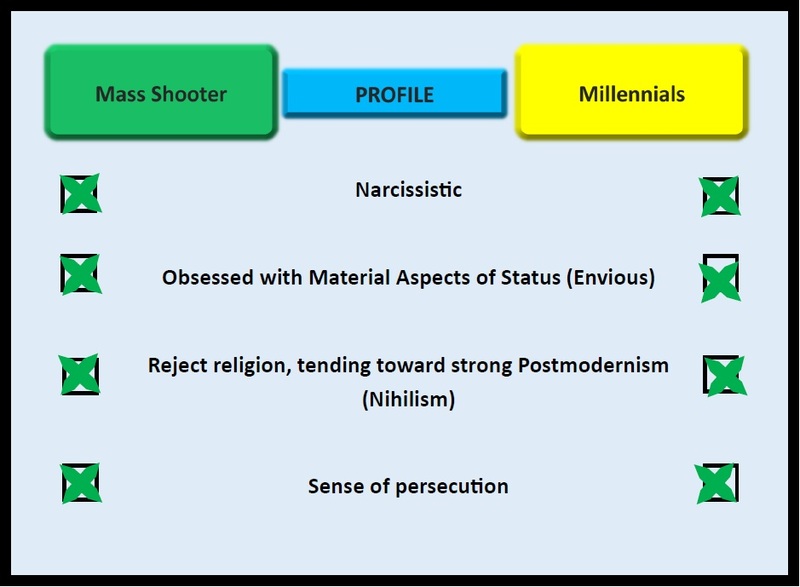 This forms a fairly stable (if somewhat broad) psychological profile of the characteristics of mass shooter. So what is a psychological profile? 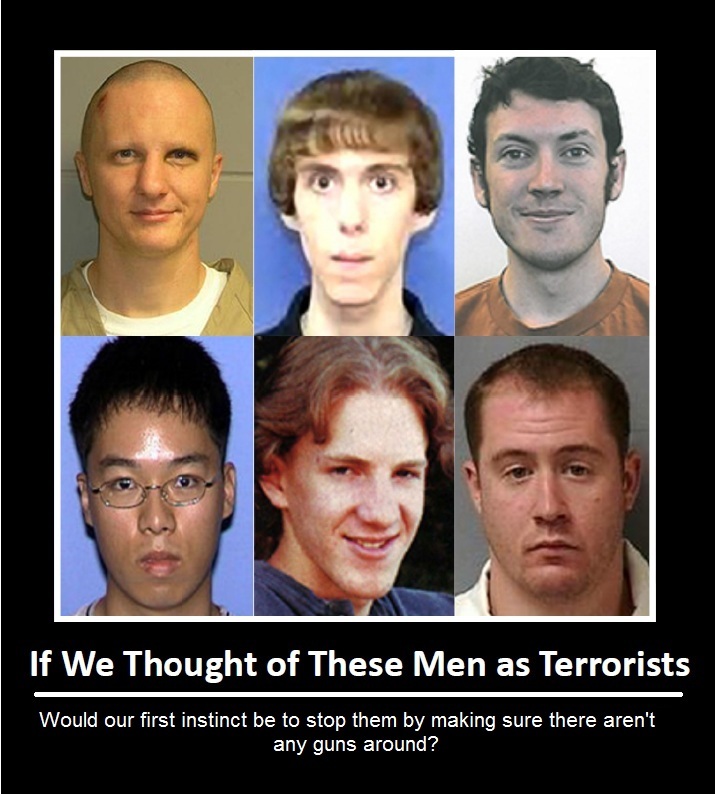 Picture a mass shooter. Describe what characteristics you’ve given this little imaginary guy in your head (it should be a guy, since most shooters are too). Is he a loner? Mentally ill? Bullied? Harboring an unhealthy obsession with violent video games? Perhaps surprisingly, studies have shown that shooters are not typically totally socially isolated (although they often have small, isolated social circles), bullied (the Columbine shooters were actually themselves bullies), or obsessed with video games. In fact, they often don’t exhibit many obvious signs of preexisting mental illness. Rather the shooters are set apart by a mentality of persecution, narcissism, envy, and nihilism, which, when combined with depression, violent and antisocial tendencies, and access to weapons, culminates in a violent plan of revenge and death which bears many similarities to a murder-suicide. At this point, we can pause and see a few reasons for particular concern. If you look at the list of factors, you’ll notice only one of those (access to guns/explosives) is really particularly susceptible to being affected by gun control legislation. I don’t want to totally minimize the obvious impact that denying means would have on the crimes, but this profile does raise a legitimate question about all of the other causal factors. Predicting an individual event may be very difficult, but can we combat the attitudes and traits that characterize these killers? Perhaps we need to — even more than we need to address gun access — because there is good reason to believe the problem may get worse. Sociologists often engage in naming and describing the characteristics of various generations, from Baby Boomers, to Generation X, to Millennials. So what characteristics have sociologists tied to the Millennial Generation (those born from the mid 80’s up to perhaps the early 2000’s)? Well, among others, the Millenial Generation is more narcissistic than previous ones, including showing measurably less empathy toward others. They are also more interested in external measures of status, such as money, image, and fame, than things like finding a meaningful philosophy of life or fitting in a community. Specifically, they also tend to reject religion in any organized form, also tending toward irreligion at a higher rate than previous generations. Finally, the narrative of persecution has become a common theme of the day. Christians feel persecuted by homosexuals. White commentators lecture a black man for declining to hypothetically draft a mid/low level talent by calling it “Jim Crow era awful.” We now catalog and measure persecution to the micro level, and, of course, Godwin’s Law states that every internet discussion eventually devolves to comparing each other to Hitler or Nazis. So, in summary, where does this put us? Now, I’m not saying that we’re raising a generation of rampage killers or that everyone who exhibits these characteristics is going to shoot up a school. However, even if we were to radically limit the number of guns available, we seem to be leaning socially toward fostering a particular mindset which is acutely susceptible to the destructive feelings of frustrated, egotistical grandeur that lead people down the path of mass murder. Again, one of the key features of these killers is that they perceive that they are being persecuted, not that they actually are, and it’s amazing how many of the rambling manifestos issued by various shooters go into detail about the things they feel entitled to but which were denied, be it “hot girls” (Elliot Rodger – Isla Vista) or “a Mercedes” (Seung-Hui Cho – Virginia Tech). As a society, we have to work to pervasively shed our sense of entitled narcissism, especially when we so often externalize the causes of our failures to achieve that materialistic ideal. We’ve looked at what characterizes someone who resorts to mass violence, but it’s perhaps most crucial to understand what the shooter hopes to accomplish by his act. Shooters often start by killing someone who they have a grudge against, but the type we’re talking about don’t stop there, and some embark on their actions with a more indiscriminate target to begin with. In all the cases that so grab our attention, it’s this seemingly random killing phase that we can’t look away from, and, in the end, it’s that arrested attention that the shooters are looking for. Commentators, lay and expert, have pointed to the fact that many mass shooters are seeking attention. John Lott points out in National Review that Adam Lanza, the Sandy Hook shooter, may have chosen the elementary school for the purpose of trying to beat the current mass murder record, a similar goal to one Seung-Hui Cho (Virginia Tech) harbored. David Kopel brings up the fact that these incidents are usually obsessively planned and fantasized about ahead of time, along with all the media coverage a shooter can expect based on past incidents. Similarly, Eric Hickey, in his important book Serial Killers and Their Victims points out that the purpose of a mass killer is often to make some sort of final statement, one which the shooter obviously strongly desires that society pay attention to. Mass shooters often feel insecure or out of control in their personal lives (in part due to a tendency to externalize the perceived causes of their failures), and this final violent act is seen as a way to assert control, make a statement, and go out with guns blazing. …And we publish these last statements all the time. If there’s no manifesto, we do what we can to find something like it — anything that gives a window into the killer’s head. The perpetrators, particularly the worst ones, become overnight celebrities, and that may be one of their ultimate goals. That’s why articles, like the great piece by Ari Schulman in the Wall Street Journal and a blog post by journalist Steve Buttry, argue that the media should consider modifying the way they cover these tragedies. (Voluntarily, of course, respecting the First Amendment.) After all, sports broadcasts don’t show unruly fans running on the field or flashing the camera under the rule that “our coverage should not glorify anybody’s illegal behavior“; shouldn’t that apply doubly here? Especially after the more recent spate of shootings, concern for the contagion effect (coverage of one incident inciting another) may be more valid than ever. This is even more true given the extensive research on this effect with suicides. (Remember that mass shootings are typically also suicides) In fact, a trial of media silence effectively ended a rash of suicides on the Vienna subway system in 1984. So how would the media need to change its coverage? Don’t report on [a shooter’s] biography or speculate on motive. It may be unlikely that the media would voluntarily embrace all of these guidelines, but they could certainly modify this list in a way that may help the issue. Ultimately, I may be naive, but I find this approach to be much more workable than the constitutional amendment needed for gun control. Essentially, I believe we can do a lot to address the problem of mass shooters by changing our public narrative. First, while promoting tolerance has its place, we need to go about this in a different manner than pointing fingers and cataloging wrongs. The narrative of rugged individualism can easily gloss over the external factors that affect our successes and failures, but an overemphasis on social and cultural structures can just as easily lead us the other way, guiding us to externalize all of our problems (we usually still like to own our successes individually) as issues of gender, class, race, or orientation. We need a more balanced approach. A similar process needs to steer us away from the glorification of status measured by external material possession, although I have a bit less faith in our ability to blunt human tendencies toward envy and narcissism. Second, we need to educate ourselves about the warning signs of violent behavior. Most mass killers mention their plans to someone before carrying them out, and many exhibit multiple signs of violent obsession which we often can only look back on. It remains very difficult to predict exactly who is going to actually decide to act on their fantasies, but anyone in a spiral of obsession, perceived inadequacy, and frustration deserves help. As Dr. Hickey points out, one of the key reasons why we so persistently link mental illness with mass killings is that it allows us to make perpetrators into “them.” We want to rationalize tragedy by distancing ourselves from offenders, but we need to come face to face with the reality that often “there but for the grace of God go I.” It’s deeply uncomfortable, but we need to humanize, rather than look for ways to dehumanize, offenders. Modern Americans are not conditioned to value community, at least not unless it comes to us strictly on our own terms. But real community can be a little nosy sometimes, and, as long as it’s done in genuine love, that’s not necessarily such a bad thing. Communities need to understand the warning signs, and then embrace, rather than shun, those who are at risk. Finally, if all of the stuff about media censorship seems naive how about tweaking the narrative in one important way? These shooters are seeking to make a statement, to impact public sentiment with their nihilistic vision through violent action. These shooters also view their actions as an endgame. They usually plan to die, whether it be by their own hand or that of the police, making this a suicide mission. What other group fits this sort of description? Terrorists. Perhaps we don’t want to dilute the specificity of the term, but thinking of mass shootings in this context seems to change the field a bit, doesn’t it? If mass shooters are terrorists, they aren’t individual celebrities; they’re part of a group. Even more, they’re probably the most meaningless, pathetic terrorists out there. Rather than advocating political change, their only real message to the world is “Look at me!” Well, if we can’t keep ourselves from looking, we can at least keep ourselves from being impressed. Similarly, if we conceptualized this type of behavior as terrorism, what is our natural response? If we contextualize mass shootings as a fundamentally terroristic act, I think it drives us to a different focus on detection and prevention that is a more helpful context than just figuring “they’ll do it anyway, let’s just make sure they can’t get weapons for it.” It’s not such an odd notion either: later evidence has shown the terrorist-style intent of some killers, such as Eric Harris and Dylan Klebold, who actually had the primary goal of one-upping the Oklahoma City bomber (who we have no problem thinking of as a terrorist) by blowing up their school. So what do we accomplish by this adjustment in our view? Aren’t we just finding another “them” category to relegate these men into? Actually, so long as the “them” occurs at the point that the actions are carried out, I think it could be helpful, at least as a second best to minimizing coverage altogether. If one of the purposes of these shooters is to assert their control, to establish the cause of their worth in a final glorious act of sacrifice, then association with a different cause, namely narcissistic nihilism (or just “look at me!”-ism) helps to emasculate the act. If this isn’t some grand, unique statement, but an attack by the terrorist equivalent of the guy who posts “First!” on a message board, then it’s more pathetic and sad than terrifying. These shooters are motivated in part by desiring not to be looked down on; if that’s all that this type of act will garner, then shooters may abandon the enterprise. Remember, unlike traditional terrorists, there’s no real underlying ideology to be conveyed, would be shooters can abandon their plans altogether at any time (perhaps the media would be well served dig up some of those stories). Similarly, if there’s no grand statement to be made, the would-be shooter may just drop the “murder” part of their murder-suicide plan. Again, the goal here is to change the public narrative surrounding mass shootings, and thinking in these terms may help society focus on prevention and detection while minimizing the attractiveness of the offense to some degree. In the end, the question of gun violence and mass shooters is multifaceted. I don’t think we should readily interchange the two issues, and while I’m not opposed to all gun control measures, I remain skeptical of their ability to resolve either problem. Instead, we need to look at why these crimes are being committed, and we have to focus on community-oriented solutions to resolving them.